The Romantic ruins of Minster Lovell Hall stand in water meadows next to the River Windrush on the edge of quaint Minster Lovell village. 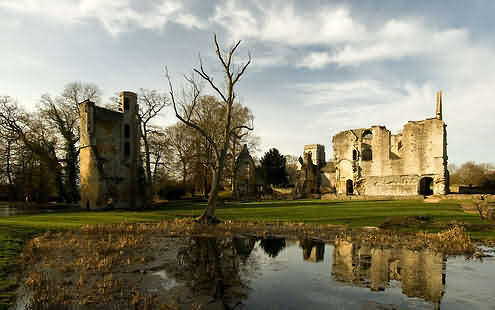 The Hall was built in the 15th century for Francis, Viscount Lovell, a close friend of King Richard III. Lovell fought with King Richard in the Wars of the Roses, escaping from the enemy at the battle of Stoke after which he was never seen again. According to rumour he fled to his Cotswold home where he staid hidden until he starved to death. The story was confirmed in 1708 when a human skeleton was found in an underground room at the Hall. The bride lay clasp'd in her living tombe. The third dreadful doom to take place was that one of the subsequent purchasers of the Hall for some inexplicable reason decided to pull down the beautiful building and raze it to the ground!